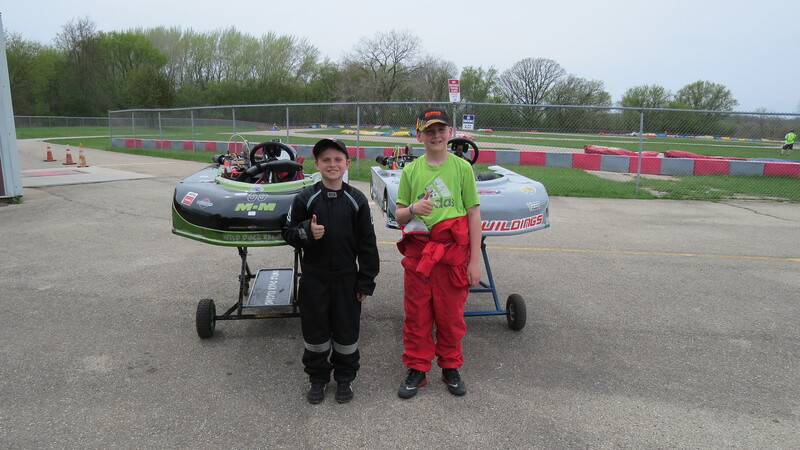 After working hard for the last few week we attended the second race weekend with the Mid-American Sprint Series at Briggs and Stratton Raceway Park, hosted by the Badger Kart Club. Jason had been struggling to conquer this very difficult track and find the best setup for his kart. Badger’s track is a series of very tight, flat turns followed by a 3 straights with 90 degree left turns between them. If you can keep the momentum up through the all of the inner corners (instructions) and hit “no-mans land” (corner 10) just right and fly down the straights at top speed, you can catch your competitors. Jason has had only a handful of sessions on this track and most of them were in his kid kart almost two years ago. If he can get the hang of this track he should be able to apply the same principles on other tracks in the series. This is a real driver’s track, requiring a host of different cornering techniques and patience to find the precise line for your kart and style. Then, you can start to race the rest of the field. The week before the race, we rested, attending school, doing homework, and playing baseball. We packed up the truck on Thursday night and set off for the track on Friday morning. The afternoon weather was expected to be nice after the morning rain. So we took our time getting packed, remembering to bring our clothes. We spent the afternoon running around with friends, fine tuning the kart, and practicing, often in that order. The last time we were there, lap times were mostly in the area of 49 to 50 seconds a lap, which is about 3 seconds off the pace. We both had work to do to find those seconds, but we would be happy running consistent 48s. Most of Jason’s time was lost in the corners. He was still slowing down too much on the entry, losing time getting back up to speed. At the end of the day he was getting closer, with a few 48s and a lot of low 49s, and signs of improvement. Saturday had some of the most competitive racing of the weekend. Jason qualified 4th of 6 in his class for the pre-feature. In the pre-feature race, he got a good start and did not give up any places but did not gain any either. He held on until midway through when Dylan (#4 from Concept Haulers) was able to take advantage of a mistake in the hairpin and popped by Jason. Jason got stuck behind Dylan and this allowed Randy (#23 from Road America) to catch up to Jason. Two laps later Jason pulled back into 4th exiting no-mans land (turn 10) with more speed than Dylan, and held off Randy till the end. The races on Sunday, also Mothers Day, were also excellent but it was a struggle to get there. Jason had crashed his bike at the track the night before and gave himself some good road rash and bruises. It was painful but superficial. When he woke up, he was immediately uninterested in racing and wanted to “just go home”. After some convincing, a bit of children’s Advil, caffeine, and strong fatherly cajoling (yup, I made him drive injured) he was convinced that he could and should race. He took to the track for qualifying and put in a respectable 48 second lap but only qualified 4th of 4. His start for the pre-feature was off and he was not able to take any advantage. A few laps later he had a good run on Randy again. They banged side by side into turn one and he got a good bump in the rear from Randy on the exit. From there it was downhill. The kart was very loose and he was not able to catch Randy again. It turned out that the last bump had moved his right rear wheel inward about an inch, throwing the kart’s handling out of whack. That said he still ran some his fastest laps in a broken kart. 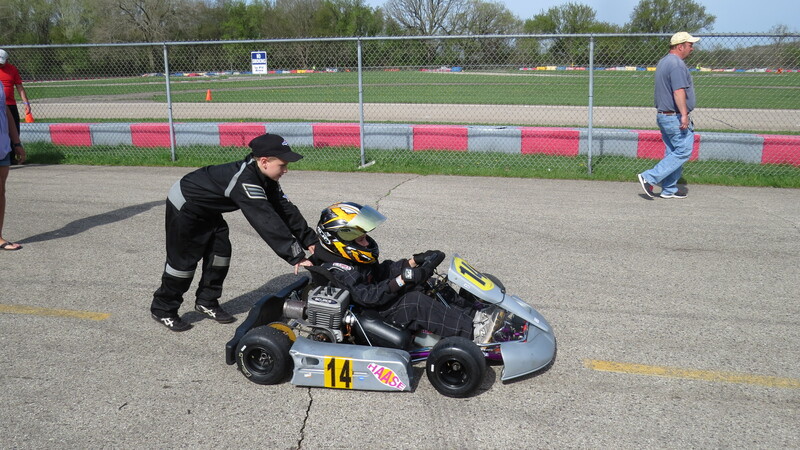 I was able to fix the kart for the feature but he was about ready to give up. He was tired, sore, and frustrated. Then we remember the cheese cows from the day before. Not only do the top three drivers get trophies they also got cows made of cheese. Noting that he had been running low 47 second laps until the bump, I said I would get him a cheese cow if he could run a 46 second lap, a lap that would be on pace with the fastest kart on the track. That brought his spirits up and he was pretty stoked about being able to earn a cow. On the green he pushed really hard and held the outside of turn one forcing Randy to drop back. For the the first few laps he and Randy dropped back from Seth’s (#88 from Road America) 2nd place. Then Jason’s laps started to get faster and the Seth started to get closer. He managed to catch and pass Seth coming out of no-mans land, putting him in second place. He just need to run clean. Unfortunately, he spun in the hair pin turn and narrowly avoided a collisions with Randy and Seth. He got back on track quick leaving Seth behind and started to make his way back up to Randy. Over the next several laps to the end he made great progress on closing the distance between him and Randy but there was just not enough time left. At the checkered flag he took third earning him a trophy and a cow. Unfortunately, he did not earn a second cow missing a 46 second lap by mere 1 hundredth of second. I would have gotten it for him but he seem so pleased that he a earned the cow on his own that it was not necessary. He spent the rest of the day exclaiming to anyone who would listen that all he wanted was his cheese cow. Next race is at Blackhawk Farms Raceway in South Beloit and the first race with Championship Enduro Series the last weekend of May. We are going to spend the next few weeks making some notes about the current kart setup and then researching and making changes to get ready for road racing. The first of these changes is taking off the Briggs LO206 that we have been using and putting on the Briggs Animal a faster more powerful motor. Thanks to his buddies that he fights with on the track, and then runs off to play catch with until the next race. Thanks to Julie Westie (Randy’s Mom) for the two of the photos. Most importantly, thanks to my Mom and Jason’s Mom.